Contemporary Toucan art printed on stickers. The toucan is found in the tropical forests of Central and South America as well as the Caribbean. Its most striking feature is the large beak. There are over 40 different species of toucans, the largest being the Toco toucan, identified by its orange and black bill. 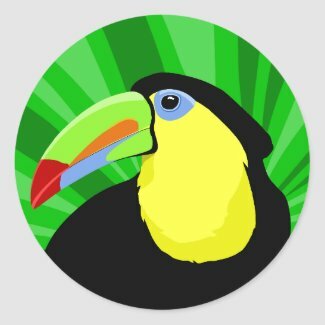 The species featured on this sticker is the Keel-Billed toucan, it has the most colorful bill in the toucan family. The Keel-Billed toucan makes its home in the holes of trees in the South American jungle.